About Your College Application Essay? It’s that time of year. Most “early decision” deadlines are counting down by the day, and other major deadlines aren’t far behind. Stay calm. Read my blog. Target your essay writing needs by using the indexed listing called “Help By Topic” in the right sidebar. 1. Don’t try to impress. Instead, look for topics that are “mundane,” or everyday. (Scooping ice cream; singing karaoke; riding public busses; having big feet, etc.) It’s counter-intuitive, but those lead to the most memorable essays. 2. Forget the 5-paragraph essay. These are not the formal, pedantic essays from English class. Narrative style, personal essays are written in a more casual, familiar style and voice. Write more like you talk. 3. Trust your stories. Look back for real-life moments or experiences you can share to illustrate something about yourself, such as a core quality, talent, value or skill. Share these “anecdotes,” using creative writing techniques such as concrete details, scene-setting and dialogue, to engage the reader at the start. 4. Focus the point you are making about yourself in your essay. Pick one aspect of yourself to explore instead of trying to jam in all the great things you have done with your life. General essays are almost always dull. 5. Show your grit. This means your “raw determination” to face and deal with problems you have encountered. If you share a problem—you are set to also talk about how you handled it and what your learned. (Problem=challenge, obstacle, change, mistake, failure, phobia, crisis, etc.). 6. Include something “that happened.” If you only tell and explain about yourself, it can get boring to read. Dull essays land in bottom of the pile. Start with a little action. Problems work best. 8. Take a risk. Try to find a topic that shows something about you that the college would not learn in any other parts of your application. Tell them something that might surprise them; something unexpected. Don’t be afraid to be different. Colleges love that. 9. Read sample essays. You can find inspiration for your own topics when you read what others students have written about, and also learn how to write in a narrative style. Find them online and in essay collections in books. My collection of essays written by former students, “Heavenly Essays,” features excellent narrative essays. 10. Be careful of overdone or loaded topics—such as sports injuries, mission trips, pets, death, illness, divorce, etc. You can write a great essay about almost any topic. It’s all about what you have to say that’s specific and original. If you faced a life crisis, and it rocked your world, you almost can’t help write about it. If you choose a sensational or overdone topic, make sure to keep the focus on you and something specific within that topic. The Prospect Cooks Up Delicious Essay Recipes! 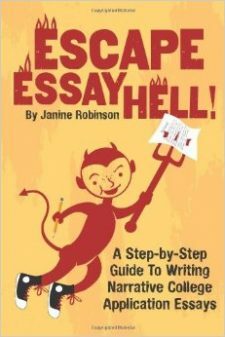 Essay Hell Tips Shared in USA Today Article! Want Two of my Guide Books for Free?